Data Protection laws and regulations across the EU govern the storage and processing of data that would allow an individual to be recognised. They are intended to address the risks around privacy and data loss, and to provide a framework for good information governance. The development of public, private, government and hybrid cloud computing services has created a challenge to on-premise data storage and processing, and thus created uncertainty regarding responsibilities of the respective organisations regarding data protection and data privacy. The European Union is soon to implement the General Data Protection Regulation (GDPR), which will bring all 27 countries under a single regime of rules, and penalties for breach. Providers and users need to be aware of the current legislative challenges. Download this white paper as it informs end-users of the current and potential future legislative landscape in Europe regarding data protection and data privacy. 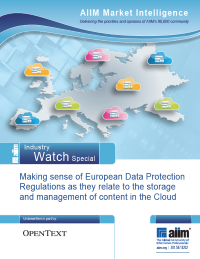 This will enable end-user organisations to make risk-based decisions about cloud versus on-premise content storage. This will also allow them to evaluate providers of cloud services to ensure that they will stay compliant with applicable law. This white paper is based on AIIM’s in-house research and the interactive guide provided by the international law firm Bird and Bird.